A tangent line to a function is a line that looks most like the function at a point. In common terms, it just grazes the function. To find its equation, we need to locate the point where the two meet as well as the slope of the function at that point. Then we can use the slope-intercept form or point-slope form of a line to get the equation. This requires a point (x1, y1) and slope m. We’ll use the function to get the point and the derivative to get the slope of the tangent line. 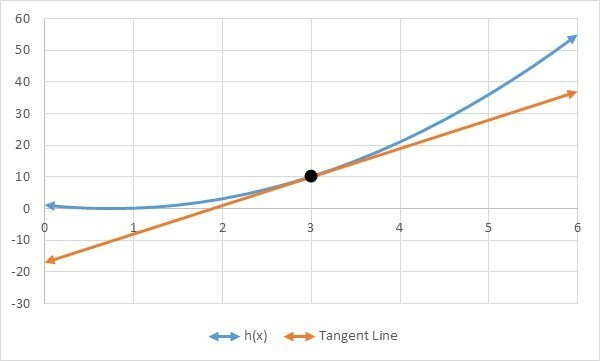 If you graph h(x) and the tangent line together, it should be obvious that your tangent line is correct (ie. tangent). Previous PostHow Can You Model Data With A System of Equations (Continued)?Next PostHow Do I Find The Inverse Of A 2 x 2 Matrix?